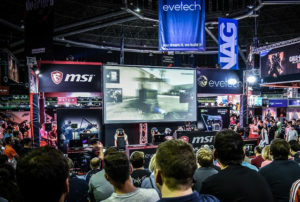 Finally, the weekend is here, and with it comes the expected gaming deals from local retailers, including a console bundle or two, a number of games and peripheral specials. 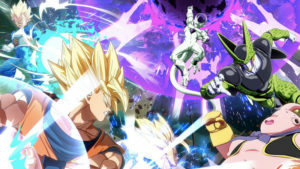 BT Games has a special on its white Xbox One 500GB console, which comes bundled with the impressive Sunset Overdrive, for R4,999.90 this weekend. 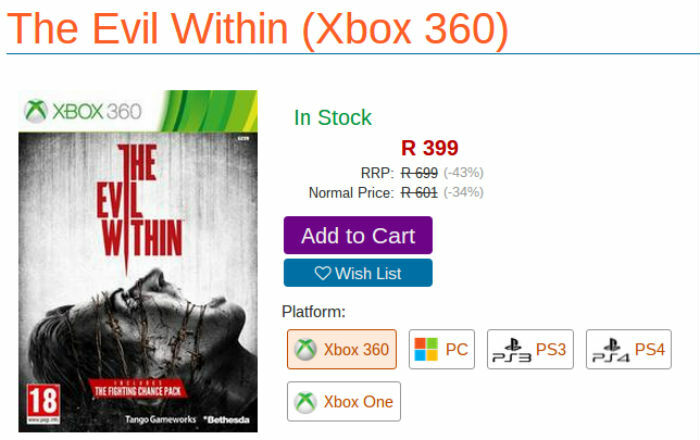 If you’re looking to make that leap to a PS4 and pick up the remastered version of God of War 3, Game 4 U has the white PS4 and game bundle for R5,799. 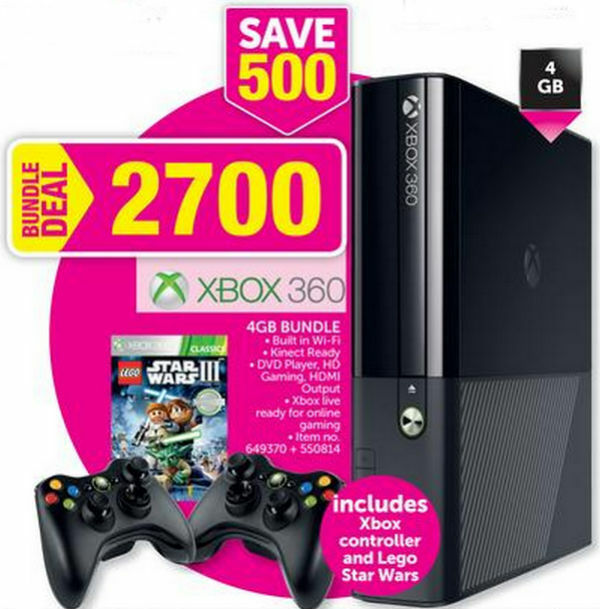 Game is currently running a promotion on an Xbox 360 and games bundle, which includes the 4GB Xbox 360 console, two controllers and LEGO: Star Wars III for R2,700. 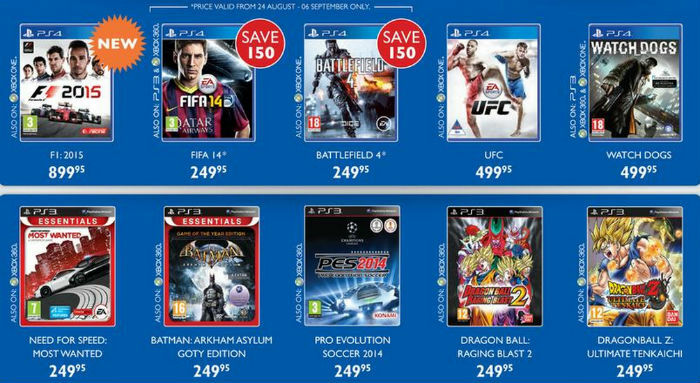 To celebrate the new month, Musica has discounted a number of Xbox One, PS4, PS3 and Xbox 360 games. 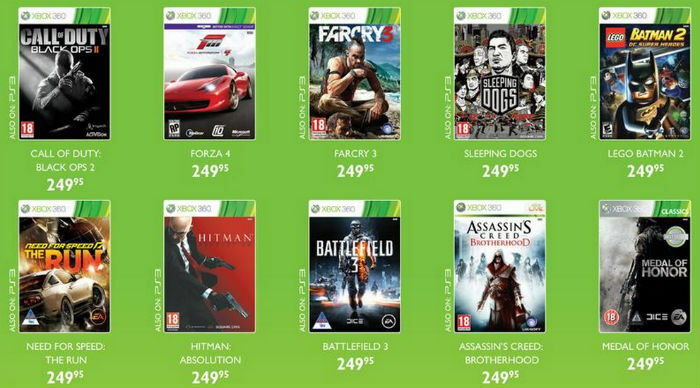 Some of the great deals include Need for Speed Rivals on Xbox 360 and PS3 for R199.95 each, FIFA 14 (Xbox One, PS4) for R249.95 each, and Battlefield 4 (Xbox One, PS4) for R249.95 each too. 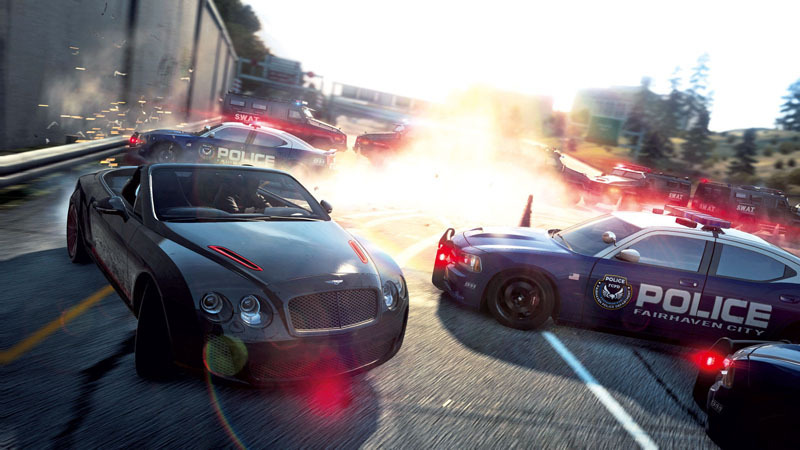 Raru currently has a number of games on sale, including the Xbox One zombie survival exclusive State of Decay: Year One Edition (R289), the PS4 racing exclusive Driveclub (R399) and The Evil Within on Xbox 360 and PS3 (R399 each). 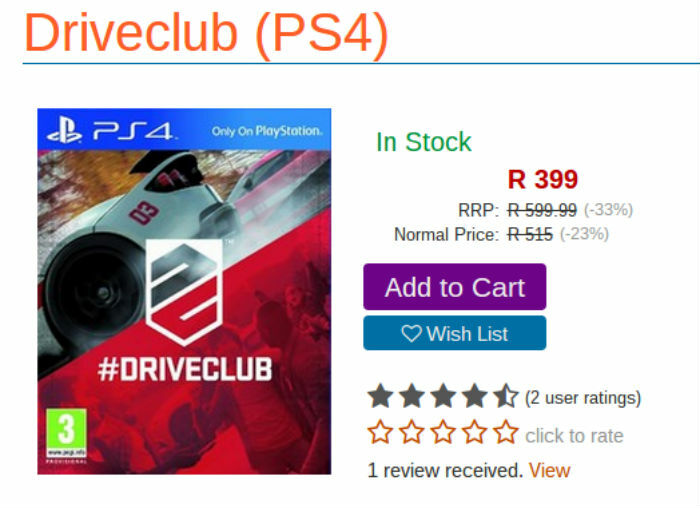 The 500GB standalone PS4 console and one DualShock 4 controller is currently priced at R5,438 from Orange ZA’s online store. 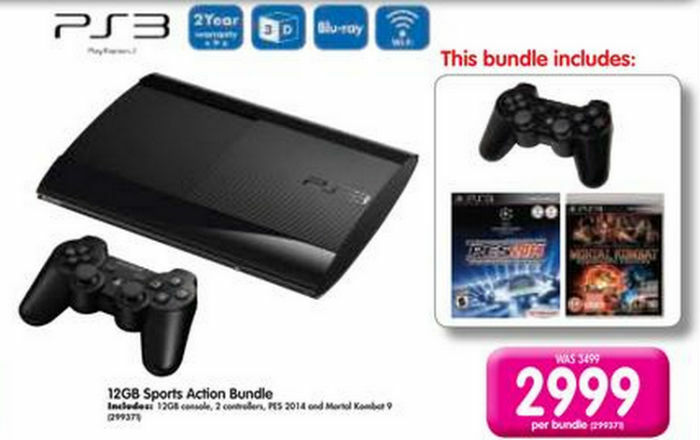 Makro has a 12GB PS3 super-slim console, two DualShock 3 controllers and two games (PES 2014, Mortal Kombat 9) for R2,999. 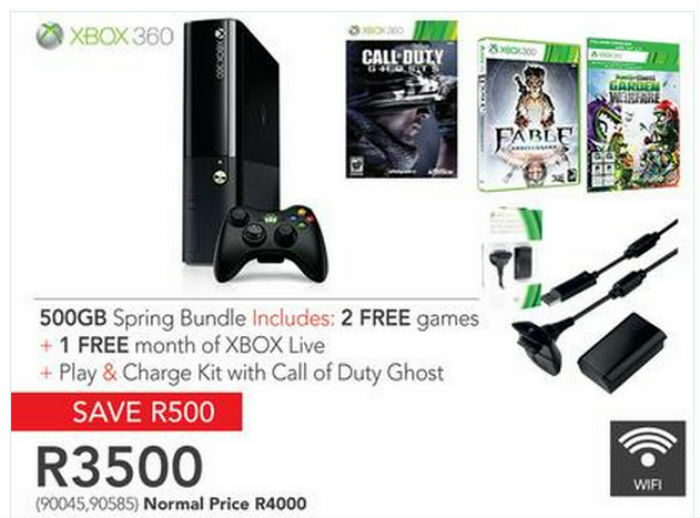 If you want an Xbox 360 bundle with some different extras, Incredible Connection has the 4GB console, one controller, a download code for Plants vs. Zombies Garden Warfare, and two boxed games (Call of Duty: Ghosts, Fable Anniversary), as well a Play & Charge kit for the controller.